Other than the quilt you have blogged about today which I'm in total love with, I like the "I Heart You" Pattern! Thanks for the giveaway! I think your Barn Dance quilt pattern is lovely. I appreciate the 'negative' or open spaces of the modern quilts. I love your Just Dandy baby quilt! So cute. I'm into making tote bags so I really like the pattern for the Chelsea bag. I love the Bloom pattern, but I must say your Dutchman's Puzzle is wonderful! Thanks for the inspiration. So many great patterns that it's hard to choose but......I like Hopscotch best. 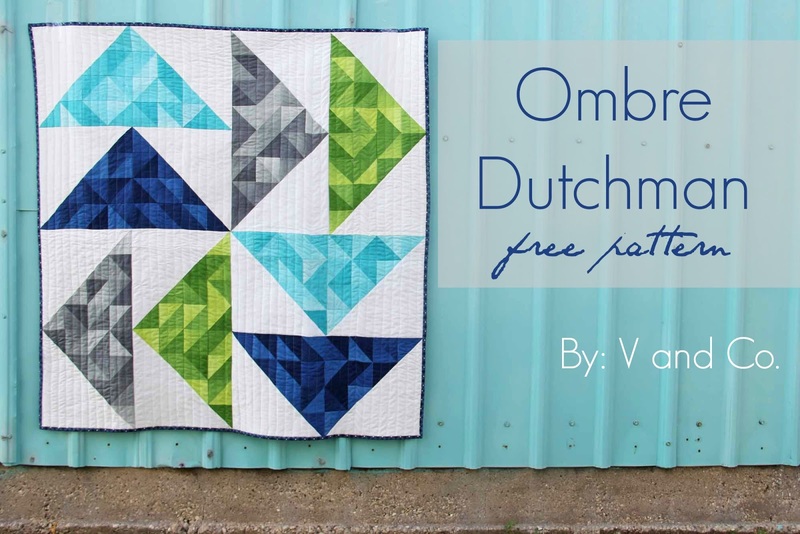 The Dutchman quilt is smashing...so graphic. I love the "I heart you pattern", it would be perfect for some of my friends who are getting married!! Before this, bloom was my favorite! Now I am torn! Great job. Thanks for the giveaway. I'm a bag lady and would love to win your Hampton Bag pattern. Thanks for the giveaway and the free pattern! I love so many of you patterns, but "Bloom" is one I've admired for a long time. I think I'd have to go with the I heart you pattern. Thanks so much for the chance! I love the pattern you shared today, thanks! I also love the Confetti quilt pattern. The hexagons are a little intimidating, but look so fun! I love the Hampton Weekend bag! I'm a sucker for lovely big bags. Thank you for the giveaway, Simply Style is my favorite line out right now! Bloom reminds me of my grandmother's flower garden. It is beautiful. Thanks for today's pattern! Love the Chelsea Bag! And I adore your fabrics. I love your I Heart You pattern - I have it and the fabric all picked out. Now to find more time to sew! My favorite is the Kaleidescope quilt pattern. Love it! The "I Heart You" pattern! 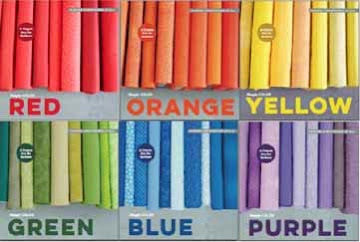 LOve your fabrics tooooo! Thanks for the giveaway! My favourite pattern would be Ruffle Argyle, but since I have it already (if I win), I hope you let me pick another. Thankyou for great block and a chance to win!!! It's really tough to pick one when they are all so awesome! Barn Dance I love! I still love your Just Dandy pattern! That is such a beautiful quilt. This one is very beautiful too. You're such an amazing designer. Hmmm... I'd have to say Kaleidoscope is my favorite! I love the traditional feel with the bright modern fabrics. Thanks for this opportunity! I like the Barn Dance quilt pattern. Thanks! I love Hopscotch!!!! Thank you so much for the chance! I love all of the patterns, but the ruffled argyle is my favorite! Thanks for the chance! I love Barn Dance and the quilt is wonderful! Thank you! Barn Dance :) You're so FUN!! This was one funny post... thanks for the smiles and the pattern and the eye candy... and a chance at your pattern Bloom and the fabric. I love the I Heart You pattern. It would be perfect for my also-very-short mother's headboard. Maybe I could make the quilt and give HER a pair of 5" heels! Wouldn't that just make her day??!! I can't decide between Bloom and Barn Dance, they're both gorgeous...so if I was a winner, I'd let you surprise me! I love your stuff! :) And I wish I could sew a straight line...that's so darn difficult...lol...but I sure try. Confetti or hounds tooth would be my pick. The color block zipper pouches. BLOOM is so pretty...make it my pick. But, the turkey is a hoot! What made you decide to design a fabric turkey? I love your houndstooth quilt pattern I have to make a baby quilt for my sister she is going to be a first time grandma. It would look great with your fabric like the one in black and white. I love your confetti quilt! I had to LOL because I am 5 feet tall and always "lie" or stretch the truth and say I am 5'1'' :) Unlike you, I never wear high heels- can't walk in em. I adore The Favorite Bag and The Banner Quilt from all your patterns! Hard to choose though. Barn Dance for sure is my favorite. Keeping my fingers crossed, hoping i'm lucky enough to win. lol I understand about size cuz I'm just skirting 5'2" now and I used to be over 5'3"!!! You go girl and do the 5" heels; that's not a doable thing for me. :) I like lots of your patterns but think Kaleidoscope is my favorite. BTW, I love this block/quilt you've made for the hop; perfectly wonderful colors. Chosing one favorite is hard! If forced to select one, Kaleidoscope is calling my name! Enjoy wearing heels! I like the Bloom pattern. Kaleidoscope is nice too. So many patterns to choose from. Thank you for the giveaway! Don't worry I'm also not the tallest person (5'5") but honestly I'm rather a bit on the short side than too tall. I love your kaleidoscope pattern and your block. I like the just dandy baby quilt - a really cute dandylion. Thats so cute! Thanks for the give away! Your Bloom quilt has got to be the cutest quilt I have ever seen. I love it. Your bags are awesome too! Thanks for the chance to win. Size does matter and you are just the right size...it is your heart that is 6 ft tall! Your kaleidoscope pattern is still one of those patterns that I lust over!! And I completely fell you on being short. I totally stretch my neck everytime just to reach 5'1" on a good day! SHORT PEOPLE OF THE WORLD UNITE!!! Nice!!! Love the turquoise…It makes the quilt pop! You mean I have to pick JUST one!!! LOL, well if you insist, I'd have to say Barn Dance is my favorite, modern simplicity but with a dynamic effect, LOVE it! Barn Dance would be my pick - thank you for sharing today. The Dutchman's Puzzle is my heritage block. The Just Dandy baby quilt is adorable! I love your confetti quilt pattern. I just love your stuff. So simple and clean and perty! I really Love the Kaleidoscope pattern…Boy that was tough closing just one! I like your Chelsea Bag Pattern.Thanks for a chance to win it. Love the block! I'm also 5'1"....for real! Actually, I think the last time I was measured I was 0.5 inch shorter :( I wore high heels for a long time until my 40s....but I like your idea of wearing heels in your 90s! My favorite pattern in your shop is the beach bag. A friend of mine made one for me, and I LOVE it!!! 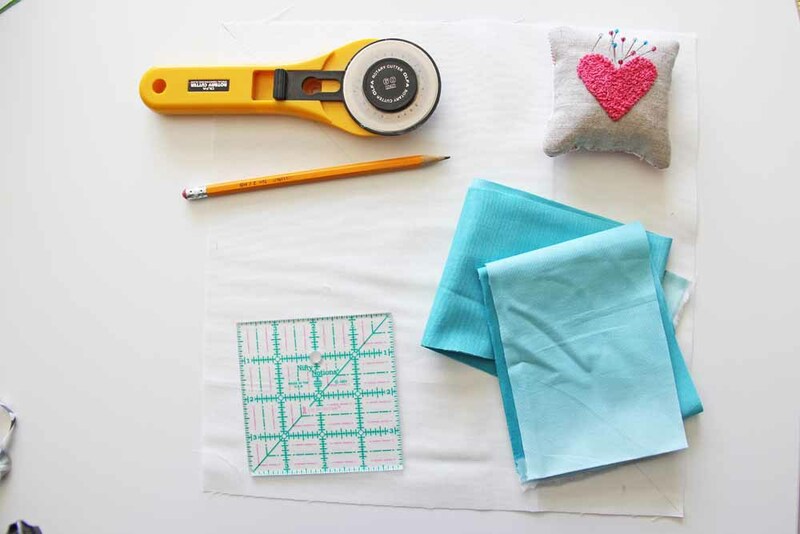 Love the block and the color all your patterns are neat but would love to try the Confetti pattern, think it would make a great baby quilt(new grand baby due in Nov.) thanks for a great blog, neat fabrics and the giveaway. I like the Bloom pattern. I really like all of the patterns you made with your ombre fabric. Thanks for the giveaway. Hmm. I'm just under 5 feet, but am perfectly happy that size. Except when I want something on a high supermarket shelf. Love your fabric, and would love to have your fabric bracelet pattern. So individual and interesting. Thanks for the chance to win. I love your bag patterns! The Hampton is super and the colored block zipper pouches!! thank you! You have a lot of great patterns but I really love Confetti and Houndstooth! I love the Bloom pattern! I love the Just Dandy quilt - when I was a kid I used t so enjoy blowing the dandelion fuzz around. Now I HATE the darn things in my yard... no doubt perpetuated by people like I was, blowing them around! I love the Kaleidoscope pattern but the Bloom is right up there with it! Thanks for the chance to win! Houndstooth by far! Love the simplicity and the classic style! I love the I Heart You pattern! for sure my favourite is kaleidoscope! Your Dutchman puzzle block is beautiful! Thanks for the free download. I love your Houndstooth quilt and the Abbey tote bag. I like your i heart you quite a bit. 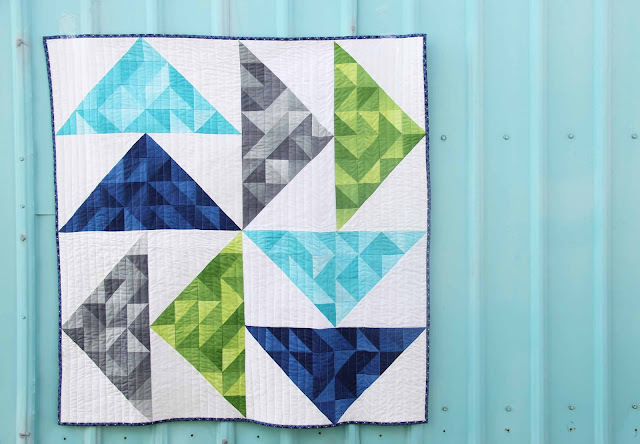 I like the Kaleidoscope quilt pattern! It's either the Hampton Weekend Bag or the Beach Bag. I just can't decide cuz they're both so darn cute! Houndstooth is my fav! And kaliedoscope. Thanks! Fingers crossed! Do you know how your brain goes, "Ding Ding Ding", when you spot something that simply put, is "just for you!"? That is what happened when I saw your "Little Sprout" pattern which is awesome!! I love everything in your shop, but I've been wanting to make "the favorite bag" for like forever, so I'm picking that as my favorite. Thanks for the giveaway! Love reading your blog! Anne M - I love puzzles! Thanks for the inspiration and the challenge - my mind is sorting fabrics for this block. I love your Banner quilt and your fabric....but especially enjoyed your story today. You paint quite the mental image of a 90 yr. old with heels riding a rascal. what great patterns you have created. I like Bloom and the braided pillow. thanks for the giveaway. ummm a favorite? Confetti and Kaleidoscope its a toss up - love them both so much! I love the Vintage Baby Quilt! Thanks for the free pattern. Would love to win some fabric. I am retired recently & can't afford to buy much fabric now. THANKS! I LOVE LOVE LOVE the bloom pattern and the kaleidoscope pattern!! They are adorable! Little Sprout and the Abby tote are my favorites! But I really like Bloom too. Thanks for the chance to win some fabric. The Abbey Tote is so adorable!! Have to say, I love the Kaleidoscope pattern! Thanks for the chance! Favorite pattern? That's easy: houndstooth! I've been lusting after that one for a couple years now (well, as long as it's been out)! Thanks for the giveaway! I love them all, but I really want to make the "I Heart You" pattern. Now you just have to convince Moda to reprint the pink ombré. Thanks for the chance. I have too many favorites. But I'll say the I heart you pattern. Thanks. Bloom! I love it. Of course, the braided pillow also calls to me. I like your block...I am a sucker for teals. I have always liked your Chelsea Bag pattern and one of these days I will make it. Thanks for sharing how to make your block..
Love all your patterns but Confetti is my current favorite. Very nice!!! Your quilt turned out beautifully!! My favorite pattern is Little Sprouts... Or Banner Quilt ... Or Just Dandy... Thanks for sharing in the hop! Your Houndstooth Quilt pattern is my favourite! Thanks for the giveaway and the Ombre quilt is wonderful! I just love your Kaleidoscope pattern. It's really neat that you live in Iowa now like we do. Thanks for the chance to win some fabric and patterns. There's nothing wrong with being short! And there's nothing wrong with wearing 5" heels either or even stripper shoes. Go for it!! All of us would change 1 or 2 or 3 things about our body if we could! I love your patterns - very creative! For a quilt I would pick Bloom and for a non-quilt, well I have never seen a turkey and vegetables made out of fabric before. How creative and wonderful! It is too cute! I think it would be fun to have people over for Thanksgiving and let them smell the turkey and then serve the fabric one. :) No, just kidding! Thanks for the giveaway! I've loved Houndstooth forever but now Bloom and Kaleidoscope are tops on my list. Thanks for the giveaway and pattern! I love kaleidoscope! And, I totally have to make that Dutchman quilt! Hopscotch is great! Funny about the Rascal! I love your spin on thebaby quilts. To pick a favorite, I can't! I absolutely love the turkey and the cake! What fun! I also really like the I heart quilt in shades of pink. I'm still smiling about that turkey tho!!!!!! I really like your kaleidoscope pattern and the houndstooth pattern. They are both gorgeous. thanks so much for sharing. I read to the bottom, I read to the bottom, w00t w00t! My favorite pattern (since I have the houndstooth) is the Hampton Bag. I'd like to make one! Thanks! What a great pattern! I'd pick it as my favorite but you already gave it to us free :) . . . so I'll pick Bloom - that pattern always makes me smile (as did your blog entry). I love the Beach Bag pattern! Thanks for the fun block and the great instructions for the quilt! I choose the Just Dandy Baby Quilt pattern. LOVE IT!! Plus the quilt you posted on your blog today is a real beauty!! Thank you for the great give away! My favorite pattern of yours is the Houndstooth. Still. I love the Dutchman Puzzle and Kaleidoscope patterns. Thanks for your blog, it puts a smile on my face and the inspiration to try new things! Love your Bubbles pattern. Would make a great companion to the Dutchman puzzle. OOOh. Kalidescope is my favorite. I love that pattern. Sooo cute!! I cannot make up my mind whether I prefer the Abby bag or the Confetti quilt pattern as they are both just so lovely. Thank you for sharing a lovely giveaway. I love the banner quilt. And in response to your blog post, I am at the other end of the height spectrum at 5'10" (my niece is 6'1"!). It comes in handy at the grocery store, but I do hit my head more than is really necessary! A woman in the store once said to me "Goodness, you're tall," and without missing a beat my mother responded "Goodness had nothing to do with it!" Color block zipper pouches. Good luck with the stripper shoe plan! I LOVE your "JUST DANDY" baby quilt pattern. I already have your houndstooth ready to make in purple and white for a baby coming this November. Unfortunately, I have to drive 45+ miles to find a shop that carries your fabric .... so I keep nagging my LQS to get your stuff! In addition to Ombre Dutchman, I like hopscotch and the Chelsea Bag. Thanks for the chance to win. Dutchman Puzzle is my favorite. My favorite would be barn dance! Love the look of that one! Hard to pick a favorite though when they are all so good! Hard decision ! Love your Kaleidoscope quilt but Bloom's a very close 2nd. I love your Bloom Pattern as well as your kaleidoscope!! I'm really torn between 3... Kaleidoscope, Bloom and Barn Dance. It's too hard to choose just one. Bloom is fun. Thanks for the giveaway. I've loved houndstooth all my life. I can't tell you how many of the clothes I sewed in high school were houndstooth. Thats my favorite, hands down. I like your Chelsea Bag patter because the size seems just right - not too big, not too small! Okay, so I'm 4'6" and a HALF...I was 4'7" before my body betrayed me and got old...No stripper shoes for me because I wear a 4 in Women's shoes and those get quite expensive...no, I get to wear 'little girl shoes'. My favorite pattern in your shop right now is Kaleidoscope and yes, I had to look how to properly spell it! I really like Houndstooth, but someday when I am very brave, I'd REALLY like to try and make the Abby Bag, it is just so darn cute! I love Dolly Parton and she also wears very high heels...so good on ya girl! I'm 6 feet tall and I too wear heels...but not very often. I like your Confetti pattern...love hexagons. Hard to choose but, I like the Favorite Bag. Thanks! I love your Bloom pattern, also the block pattern. Thanks for the contest. I love your humor! My favorite pattern right now is bloom! I love the beach bag pattern! Such a great tote for a mom. My favorite pattern is Barn Dance, and I love the story you tell about the dances inside the barns, as well. I love connecting things like that to a quilt. Oooh I want to make the Houndstooth Quilt!!! I love it! I love the I heart you quilt....wait I love them all....but I heart you is my favorite! Thanks for the laugh and the great things you do....and for the give away! Banner Quilt is my favorite! I had to quickly say it because I might just change my mind and tell you the dandelion quilt or the bloom or the strawberry cake - I love them all! Your post cracked me up - I'm also short and can relate to everything you said. You gave me the idea to wear high heels in the kitchen so I don't have to call for help to reach the dishes on the higher shelves. I can't wait to share your post with my 4 shrimpy sisters! Lots of great quilts. Love them all. Lots of inspiration. Thank you. Wish all who read this a great day. I love your Confetti pattern. It would be a stretch for me with all the negative space. It's really hard to just pick one patterns - I like several, but I guess I like Barn Dance the best. I love Bloom, but Kaleidoscope is my true favorite!! Thanks for the chance to win! I love your bubbles quilt pattern. It's a happy joyful kind of quilt, and the fabrics you used for the cover photo are awesome. I'd make it with those colors too. Thanks! thanks for the giveaway and the free pattern, which I love. I <3 U is my favorite! Although Bloom is a very close second! Great job on the quilt and the heels. My 93 year old tops at 5 in her heels. She still wears them! I love the flirty skirt pattern. I love the Hopscotch quilt pattern! I have to say I like a lot of those patterns but bloom really caught my eye. Thanks for sharing. The Ruffle Argyle Quilt PDF Pattern is my choice. Thank you for being a part of the Size Matters Blog Hop and the wonderful opportunity to become one of your winners. Anyway, I do love the Dutchman Block. I am not able to download the file but it appears that maybe United Notions site is the cause of the problem because I cannot get to their site at all. I'll try again later. Thank you. Choosing a favorite pattern from your site really is very hard decision as I love so many already. I know that from the time I first saw it that Bloom has been a favorite of mine. Barn dance is my fave, but ruffled argyle comes in a close second. Love your pattern and fabric. Thank you so much for the wonderful giveaway. There are a few I love as well but I think that is the one I pick first. Houndstooth has always been my favourite pattern of yours. BLOOM quilt for me. Lovely. Love the Beach Bag pattern!!! I'm not interested in clothes and bags - HAD to do that when younger, not gonna CHOOSE it now. LOL But I liked hopscotch quite a lot. Thanks for the giveaway. I like your big block, and loved you on the Schoolhouse film. I love your Confetti pattern. Your wallhanging is cute, too. Thanks for the chance to win some of your fabric and a pattern. 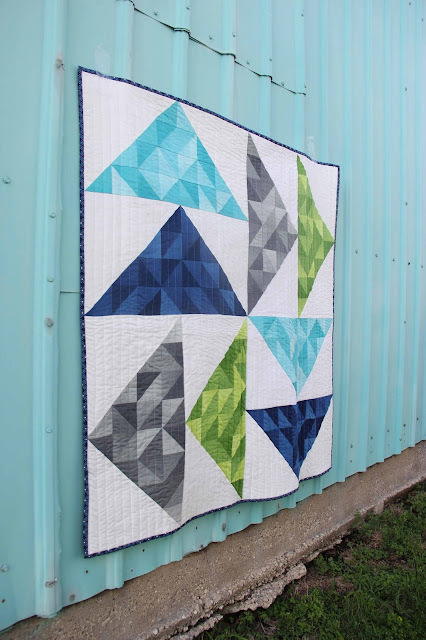 Absolutely LOVE the kaleidoscope quilt-PDF pattern! Thanks for the chance to win! Great pattern and love the colors. 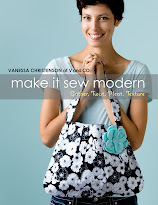 Thanks for taking part in the Moda blog hop. Love the quilt you had on the blog for the hop, and in your shop I would have to pick houndstooth pattern. Thanks for all the fun. I love your banner quilt pattern, so if I had to pick a favorite, this would be it. Thanks for the chance to win! I think my favorite pattern is Kaleidoscope. My favorite is Kaleidoscope. I have read your blog off and on for a long time and never realized you are not as tall as some people. You certainly have a lot of talent in that small package! Thanks for sharing the awesome pattern. Love love love your I Heart You pattern. I am definetly a heart pattern girl. Thanks for the block pattern and opportunity to win. Your patterns are so happy. I just smile when I see confetti and kaleidoscope. Thank you very much for your tut on the flying dutchman...your design makes me want to repaint my dutchman puzzle on the barn. I love the quilt you designed for this hop! But I also love your Confetti Quilt! Thanks for the chance. Beautiful big quilt! Love Little Sprouts pattern. Thanks so much for the chance! Your Bloom pattern is too cute! Thanks and keep wearing your heels! I really like confetti, the random placement of the hexagons is unusual and playful. It's a toss up. I love both Little Sprouts and Bubbles. I love Houndstooth. It's very clever. I love bloom. Thanks for hosting a giveaway.